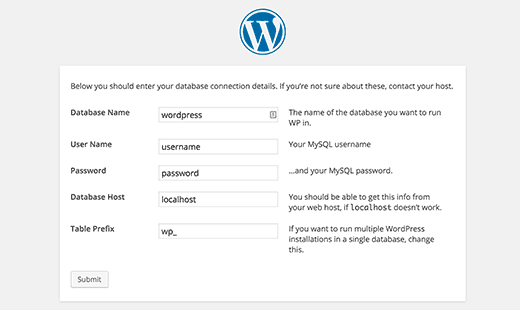 In this tutorial, we’ll walk you through how to install WordPress on your hosting provider. For any website to work, you must have a web hosting service and domain name secured. If you don’t have these setup already, click here. Next Step – Install your theme. The first thing you’ll want to do, is to confirm that your hosting provider is compatible with WordPress. To start the installation process, first you need to download WordPress from it’s official download page. We recommend that you always download and install the latest version of WordPress. Once you click the Download link, the installation package will be saved to your hard disk. Next, locate the installation package that you have downloaded and extract it to a new folder. Now, you need to upload the extracted files and folders to your web server. The easiest way to upload the installation files is via FTP. For detailed information on what an FTP is or how to upload files via FTP, you can read more here: FTP Tutorial. IMPORTANT! If you want your WordPress to be the main installation on your account and to be accessible through your main domain (i.e. www.mydomain.com), you need to upload the extracted files to your public_html folder. Once the download is complete, extract the archive and upload it to your web hosting account. You can do that via FTP using a client application like Filezilla. If you want this WordPress installation to be your main website, the files should reside in the public_html folder of your account. You can always make a subfolder (i.e. 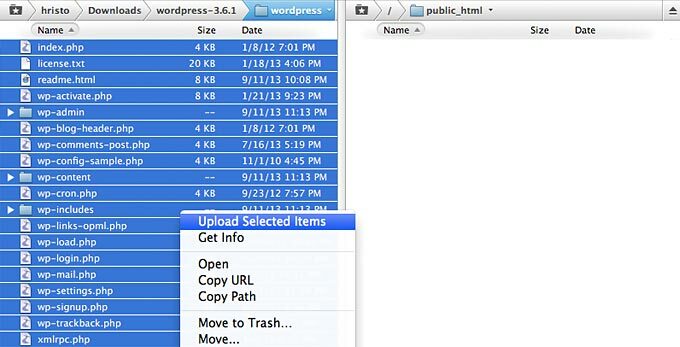 public_html/blog) if you want to run only part of your website on WordPress. You will see a field to create a new database. Enter your database name, and click “Create Database”. Now that you have created your database, MySQL still needs a username. This username will have access to perform actions on the database. On the MySQL Databases page in your cPanel account, scroll down to MySQL Users section. Simply provide a username and password for your new user and click on the ‘Create a user’ button. This new user still does not have access to the database you created earlier. For that you will need to add the user to the database and give them permissions to perform all actions. On the same MySQL Databases page in your cPanel account, scroll down to “Add User to a Database” section. Select the database user you created from the dropdown menu next to user, then select database, and click on the “Add” button. You will be now asked for the privileges you want to allow this user. Select all privileges and click on the Make changes button. Your MySQL database and user are now ready, and it is time to run the WordPress install. Simply go to to the URL where you uploaded WordPress. If it is in the main domain, then enter your domain name in the browser window, like yoursite.com or www.yoursite.com. You will see the language selection page. You can choose a language here so that rest of the installation is displayed in your own language. You can also use English for now and then later change the language. Click on the “Continue” button to proceed. You will now see some installation instructions. 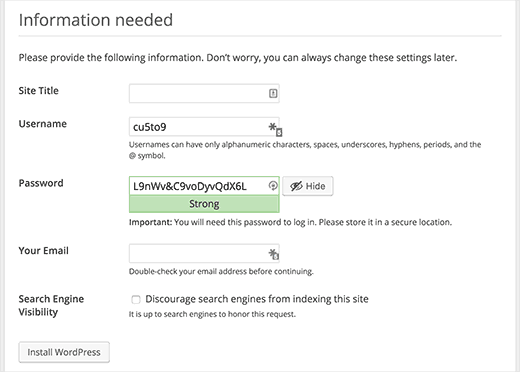 WordPress will now tell you that it requires your database name, password, and mysql host information. Click on the “Let’s go” button to continue. WordPress will now show you a form. Now enter the name of the database you created earlier. Fill in the information and click on the “Submit” button. 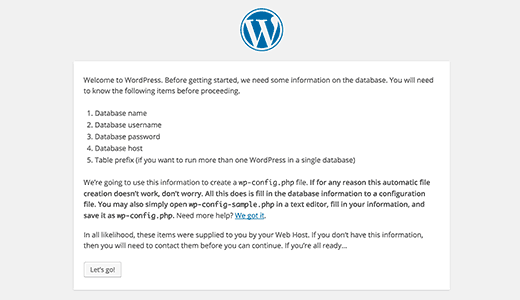 WordPress will now connect to your database and show you a success message. Click on the “Run the Install” button to continue. WordPress will now create tables in your database and send you to the next step of the installation. Now you need to provide some information for WordPress to setup your site. This includes site title, username, password, and admin email address. If you do not want your website to be visible to search engines, you can check the box next to search engine visibility. If you are unsure about what to do, then simply leave it unchecked. 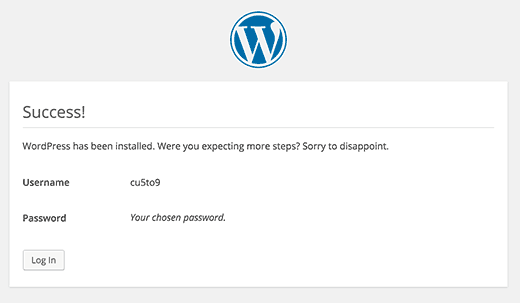 Click on the “Install WordPress” button to continue. WordPress will setup your website and finish the installation. You will see a success message showing your username (save this you’ll need it). You can now login to your WordPress site.